Restore hair moisture and instantly detangle hair for easier combing. 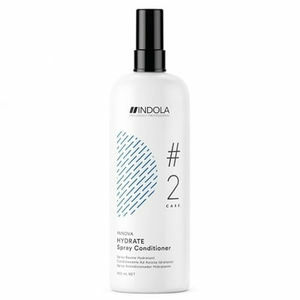 Indola Innova Hydrate Spray Conditioner represents step #2 in the Indola Innova Hydrate hair care programme and contains jojoba oil to deal with detangling your clients' hair while it replaces moisture to leave hair super soft and nourished. It combines this with Indola's pixel technology to bring hair back to a virgin-like quality with glorious colour shine. £6.06 (inc. VAT) Why no VAT? We're a trade wholesaler and quote our prices without VAT to help our VAT-registered customers understand the true cost of a purchase.